Russian team is victorious despite losing time when Karginov stopped to help a Chinese competitor. 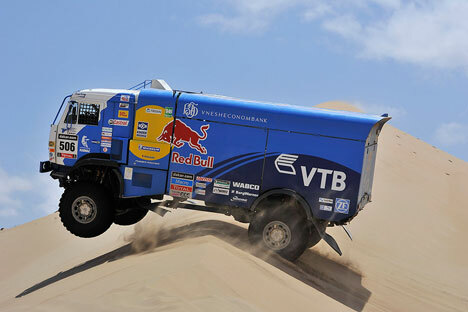 Russia’s Team Kamaz Master has scored its 12th victory in the truck race at the prestigious Dakar rally. Andrei Karginov secured the team’s latest win in a dramatic finale. Formally, he won the race after the rally had already finished, but the organizers gave the Russian racer the minutes he had lost helping out a Chinese car that had an accident and blocked the track. As a result, Karginov’s Kamaz was able to retain its lead in the overall standing over the Dutchman Gegard de Rooy, racing for the Iveco team. The final stage of this year’s Dakar rally was full of suspense. De Rooy’s was the first truck to set off immediately after the last car. Then a Mini driven by China's Zhou Yong had an accident on the 90th kilometer of the stretch and blocked the track in front of the Dutchman’s Iveco. De Rooy managed to steer around the Mini, but the trucks that followed, including the Kamaz, were held back. Andrey Karginov’s crew was instrumental in helping to set the Mini back on its wheels and clear the track. But the Russians lost a lot of time in the process, and after they had crossed the finishing line it turned out that they had fallen more than nine minutes behind de Rooy in the overall standing. But the Dutchmen did not celebrate his victory for long. There is a long-standing practice at Dakar: if a team can demonstrate that it was forced to stop and help another racer, the lost time is returned. After that lost time was taken into account, the Russian team came in front of de Rooy, who was relegated to second place. The third place went to the winner of last year’s rally, Russia's Eduard Nikolayev, also driving a Kamaz. Another two Russians, Anton Shibalov and Dmitry Sotnikov, took the fourth and the fifth place. Victory at Dakar 2014 has been the third in a row for Team Kamaz Master, and its 12th since it first took part in the series. The first Kamaz victory was won by Viktor Moskovskikh in 1996. After that the Czech Republic’s Tatra team dominated the trucks category; it scored three wins in four years. Since then, Russia has been an undisputed leader. Vladimir Chagin, the current head of Team Kamaz Master, has won seven rallies (in 2000, 2002-2004, 2006, 2010 and 2011). His partner, Firdaus Kabirov, won in 2005 and 2009. Eduard Nikolayev and Andrey Karginov now have one victory each (in 2013 and 2014, respectively).